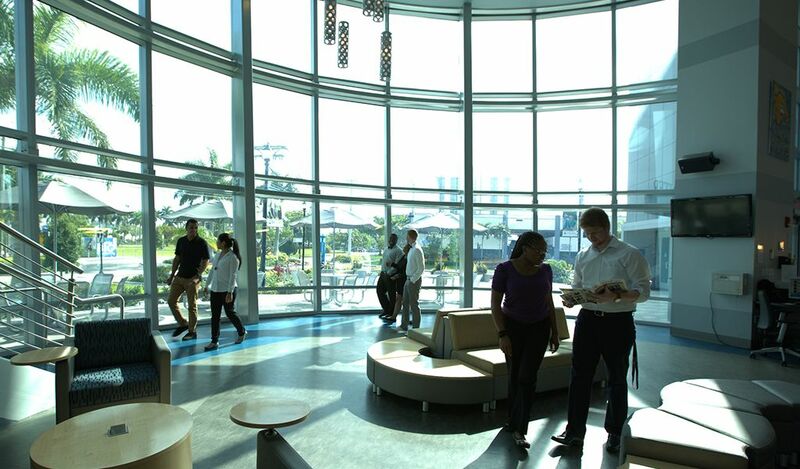 Welcome to our North Miami Campus! Located in South Florida’s commercial and cultural hub, our palm tree-lined North Miami Campus provides a full university experience in a multicultural setting, with the extracurriculars to match. Our 30 clubs and organizations span social and cultural interests, Greek life, professional development and student publications, as well as leadership and community service programs. From study breaks to movie nights, camping trips to poolside barbecues, our residence halls buzz with activity, too. We even have living-learning communities, where you can live with your peers and take part in co-curricular activities tailored to your academic interests. JWU is also committed to making a quality education as accessible and affordable as possible, increasing institutional aid every year for the past five years. As of 2016-17, more than 97 percent of North Miami Campus students receive institutional scholarships and/or grants from the university, and we remain active members of the community, with our students having performed more than 31,000 hours of community service in 2015-16.